Back in April, we talked about a useful Xposed Framework module by XDA Senior Member hamzahrmalik that allowed users to increase the number of allowed lock screen pattern attempts. This is incredibly useful for those who would like to use a particularly difficult to remember and enter lock screen pattern, as well as those who have the pattern set to not display entry attempts. In the time since, the previously covered module has been discontinued. Luckily, hamzahrmalik followed up on his previous creation with the new LockScreen Tweakbox module, which continues right where its predecessor left off, and adds many new features. In addition to offering unlimited pattern unlock attempts, users are also able to hide the next alarm text and emergency call button. 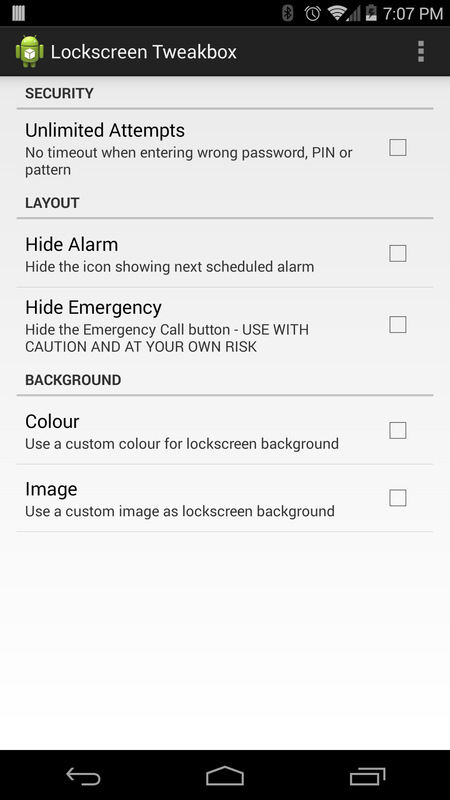 You can also set a custom background color, image, or both, change the pattern dot and trail colors, change the unlock ring icon, allow for notifications with lock screen security, show the clock in the status bar, and make noise when an incorrect password is entered. Essentially, LockScreen Tweakbox offers everything that its predecessor offered–and then some. Future updates will also likely bring the ability to change the status bar color and visibility, swap navigation buttons for music controls, and more specifically change how many attempts you can have. If you’re looking to tweak basically everything about your lock screen, look no further. Head over to the LockScreen Tweakbox module thread to get started.